The Council of State Governments has focused on improving Section B of the EAVS for the past year and a half in coordination with the U.S. Department of Defense’s Federal Voting Assistance Program, or FVAP, and the U.S. Election Assistance Commission, or EAC. The CSG EAVS Section B Working Group was formed, consisting of 13 state and local election administrators from across the nation. Securing quality election data from the states has been a challenge for decades. The EAC administers EAVS, a federally mandated biennial survey, to collect state-by-state data on the administration of federal elections. A corresponding EAVS report captures data on the ability of civilian, military and overseas citizens to successfully cast a ballot and contains the most comprehensive, nationwide data about election administration in the United States. It is a survey of all states, the District of Columbia, Guam, Puerto Rico, American Samoa and the U.S. Virgin Islands. The careful collection, management and analysis of good election administration data is critical to providing voters with the highest quality electoral experience possible as well as helping state and local election administrators run better elections. State election administrators use EAVS data to design election administration policies addressing the number of advanced voting locations, election administration office hours, the implementation of online voter registration systems and the use of voter information and voter communication tools. -Improve the understanding of each survey question. -Establish greater outreach to states prior to the submission of each biennial survey. “We’re very pleased that through our collaboration with FVAP to create the Overseas Voting Initiative and implement its many projects, we have been able to convene such a knowledgeable and dedicated group of election officials to work up solid improvements to the 2016 iteration of Section B of the EAVS and to join with FVAP and the EAC to set a path for future improvements to the survey,” said Kamanzi Kalisa, director of CSG’s Overseas Voting Initiative. The CSG EAVS Section B Working Group is part of the CSG Overseas Voting Initiative, which was launched in 2013 in collaboration with FVAP to improve the return rate of overseas absentee ballots from service members and U.S. citizens living abroad. The report itself is really smart about addressing the need to improve both the quality of data received and response rates. Especially interesting is the discussion of question wording; the working group identified areas that could be confusing to state and local election officials and proposed wording changes intended to elicit responses that are both clear and complete. So, for example, rather than ask for the number of UOCAVA ballots “returned and submitted for counting,” the survey would ask for ballots counted and ballots rejected – which gives both a complete picture of the total ballots received and the percent that were ultimately counted. There are numerous other examples like this in the recommendations, which should align more neatly with election offices’ existing data systems and result in better responses to the EAVS. (4) allow jurisdictions to ask questions about the EAVS. The Section B Working Group conducted its work at the same time as the CSG Technology Working Group’s Data Standardization/Performance Metrics Subgroup. The Data Standardization Subgroup considered the benefits that would be achieved from having a single standard for collecting and reporting UOCAVA-specific voter data at the transaction level—each critical interaction between the voter and state or local election office. The subgroup recognized how the data currently reported in the EAVS Section B—the UOCAVA section of the survey—could be standardized for reporting purposes as part of an EAVS Section B Data Standard. All in all, there are a number of tremendously good ideas in what is a relatively short report – reflecting CSG OVI’s clear focus on useful solutions that not only should be, but actually can be implemented at the election administration level. Kudos to the Working Group and the entire CSG OVI team – especially Michelle Shafer, one of my favorite electiongeek lifers – for their work on this very important topic. This is data release season, with EAVS data for 2016 coming very soon … stay tuned! 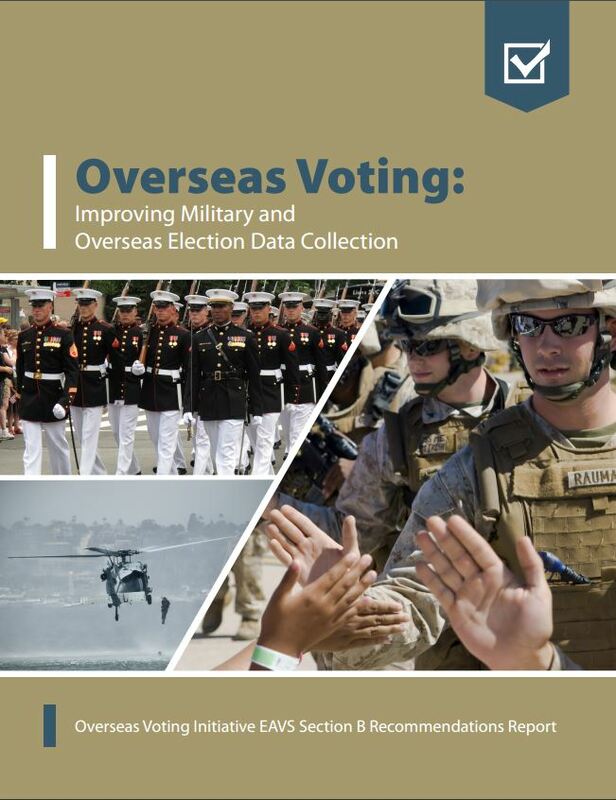 Be the first to comment on "CSG’s Overseas Voting Initiative Releases New Report on Improving UOCAVA Data Collection"